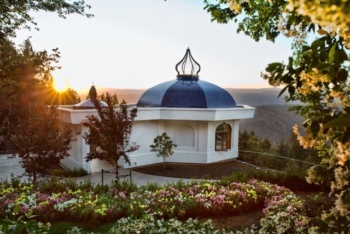 With the help of Ananda Worldwide and through donations by devotees from around the world, a meditation temple called the “Moksha Mandir,” meaning temple of spiritual liberation, was erected in honor of Swami Kriyananda’s life. In this sacred mandir, Swamiji’s remains were placed in their final resting place. In accordance with Swami Kriyananda’s wishes, the Moksha Mandir was built on the grounds of his home in America, Crystal Hermitage, which sits at the heart of Ananda Village. Crystal Hermitage will become a greater place of pilgrimage for truth seeking souls everywhere to experience the vibrations of Swami Kriyananda and the path of Kriya yoga as taught by Paramhansa Yogananda. All are welcome to visit, and to receive the blessings of this sacred place.